Birmingham City Ladies captain Laura Bassett is to leave for a second time after rejecting a new contract with the Champions League quarter-finalists. Nuneaton-born defender Bassett, 30, who initially joined Birmingham from Coventry City Ladies in 2000, left in 2008 to sign first for Arsenal, then Leeds, before rejoining Blues in 2010. 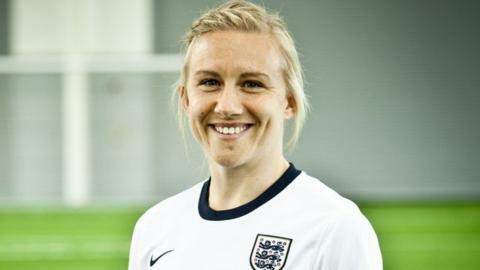 "She's been pivotal to Blues Ladies," team-mate Karen Carney told BBC WM. "It's massively disappointing that we can't hold on to her." Carney continued: "She's fantastic. She's my best friend, the captain and a great role model. Everything a club would want. "Whoever she goes to, she will be a massive asset to them and obviously be a massive loss to us. I know she'll kick on and show us what she's missing." Birmingham qualified for the Champions League quarter-finals for the first time with a 5-2 second-leg win over Russian side FK Zorkiy Krasnogorsk last Tuesday, in their first-ever game at St Andrew's. Their 7-2 aggregate victory puts them in Thursday's draw for the last eight in March, along with Barcelona, 2007 winners Arsenal, and holders Wolfsburg. The draw also features another German side FFC Turbine Potsdam, who won in 2005 and 2010, Italian side ASD Torres CF, Austrian side SV Neulengbach and Sweden's Tyreso FF.